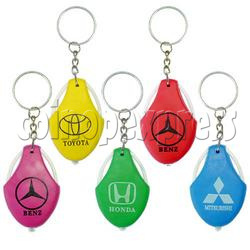 This series of light-up key chains is designed in a wheel shape and printed famous car brands like Toyota, Bens, IBM, Honda, Mitsubishi on the surface. They are available in various colours as screen shots. The keyholders' body is made of PVC. A bright LED is put in bottom, light provided by two 3V LR-1130 button cells with long lasting power. It is ideal to use as a decorative ornament in your car. Made of soft PVC material. Size: H4.5 x H1.5 (cm). A bright white LED light. Two 3V LR-1130 button cells. Minimum order quantity: 960 pieces ( can be mixed with different styles as colors shown at screen shots). 12 pieces packed in blister pack style. 120 pieces packed in an inner carton, gross weight: 2.1 kgs, carton size: W220 x D230 x H180(mm). 480 pieces packed in an outer carton, carton size: W470 x D490 x H185 mm, total 2 cartons for 960 pieces order.